Best. Beets. Ever. Sans the hard-cooked eggs, which Tanis said were optional. “As Bokonon [actually the late author Kurt Vonnegut] says: ‘Peculiar travel suggestions are dancing lessons from God. '” And I’m sure, were Bokonon here, he’d be happy to include “peculiar dining suggestions.” A couple of weeks ago, my pal Dan Fredman sent me an email about a wine dinner happening at Lucques in Beverly Hills, celebrating both the loose confederation of wine producers known as In Pursuit of Balance and the release of chef David Tanis‘ latest cookbook, One Good Dish. It was on a Thursday night, which interfered with The Bride’s workout schedule, and it was to start at 7 PM, which is always a challenge in Los Angeles traffic. I knew of Tanis tangentially, but I was not deeply acquainted with his history, so my natural tendency was to give it a miss. But Bokonon spoke to me, as he often has before, so I made the reservation, albeit with some reservations. 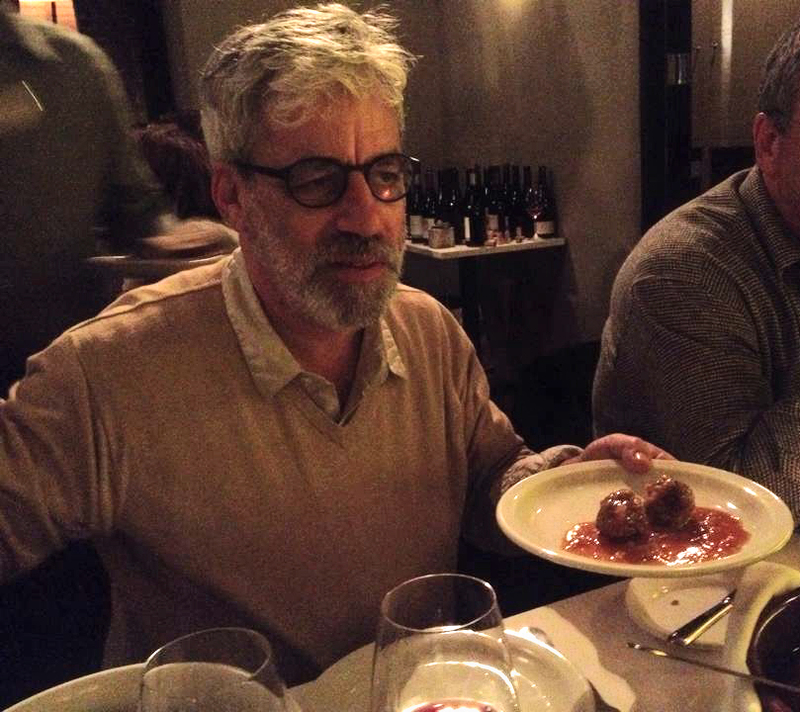 But not many: dinner at Lucques has always been delightful, and at the worst, I’d have a chance to hang with Dan, which is always edifying. Also, as part of the deal, I’d get a copy of the cookbook, which kinda made the whole thing a bit of a no-brainer. When we arrived, Dan greeted us and bade us to sit at his table, where Tanis himself was ensconced, along with a couple of other of our acquaintances whose conviviality is highly evident. The author was, by design, supposed to circulate. In practice, though, he hung out mostly at our table, often serving the dishes that he himself created. He cooks, he scores. He even serves. The entire menu was — and this is a technical term — really tasty. 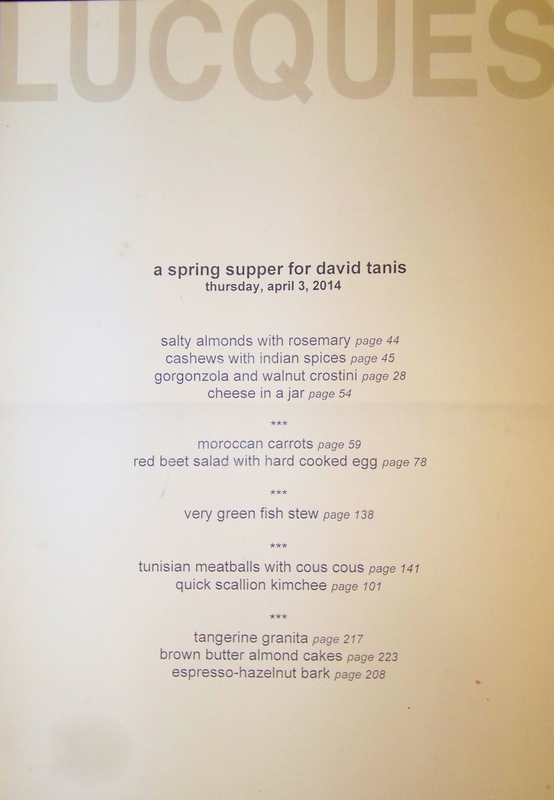 All of it came from One Good Dish, with page numbers thoughtfully included. No doubt I could wax poetic about the crostini, or the espresso-hazelnut bark, and perhaps I will after I have made them. 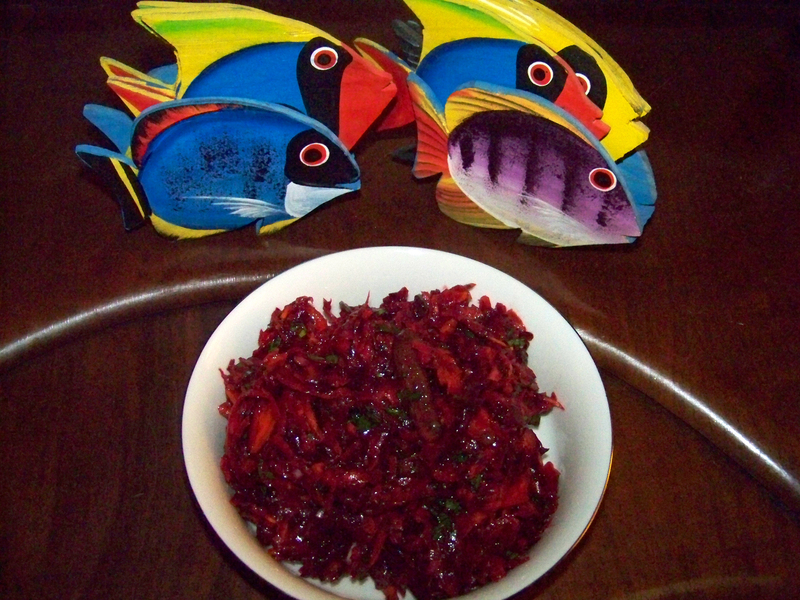 But this time, I’m going to lavish my praise upon the beets. 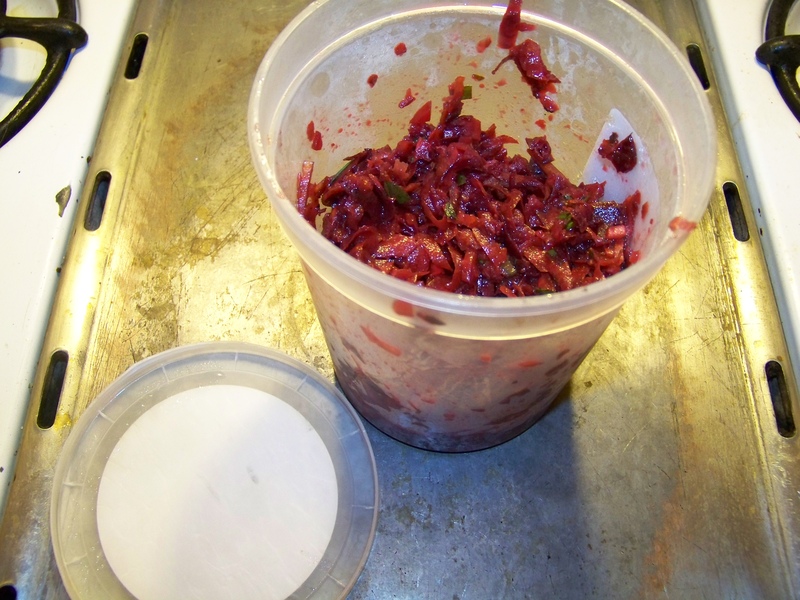 Tanis’ Red Beet Salad, at its heart, is grated raw beets served in a fancy vinaigrette. 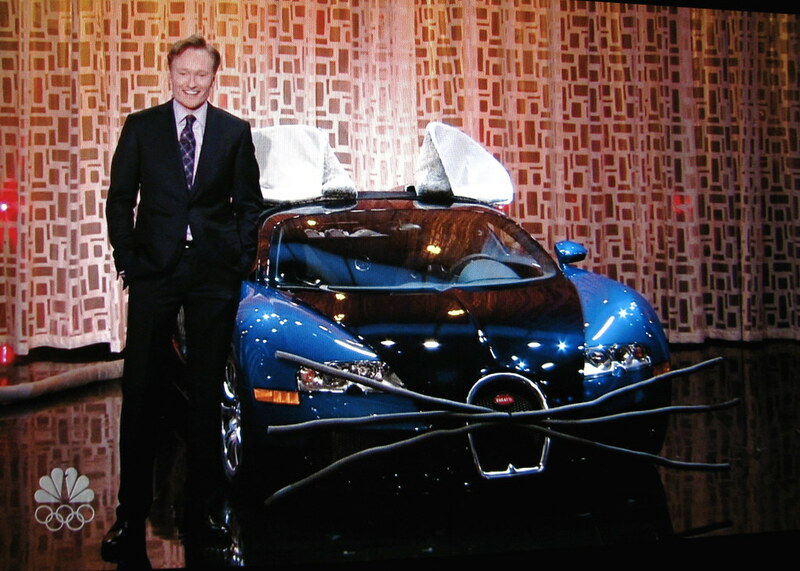 And the Bugatti Veyron, at its heart, is a motorcar. The ingredients aren’t hard to locate or particularly sophisticated, but it’s absolutely worth using the very best available to you, especially super-fresh beets, and really good Dijon mustard, red wine vinegar, and olive oil. I used some red wine vinegar that I had picked up at Turley Wine Cellars, and cold-pressed extra virgin olive oil from Oliana. A minor digression: The difference between $15 olive oil and $3 olive oil is often hugely significant. I highly recommend splurging whatever your budget can afford on a great bottle of olive oil for finishing soups and salads, serving on bread, etc. Oliana in West Hollywood and Beyond the Olive in Pasadena and Stonehouse California Olive Oil in the San Francisco Ferry Building all have tasting rooms, where you can select from a variety of olive oils with a wide spectrum of characteristics. 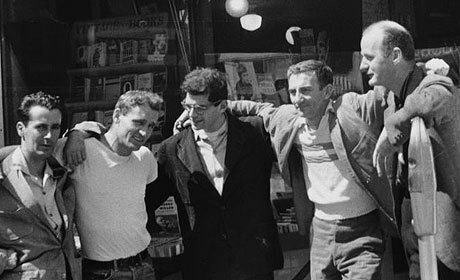 Most major cities in America have some gourmet store that offers a similar experience. [2017 update: Of late, we’ve been subscribing to a thrice-yearly variety package from Olea Farm in Templeton, CA.] Do give it a go; if you haven’t done it before, you will be shocked — pleasantly, but shocked nonetheless — at just how different olive oils can be. All you need to make this excellent salad. 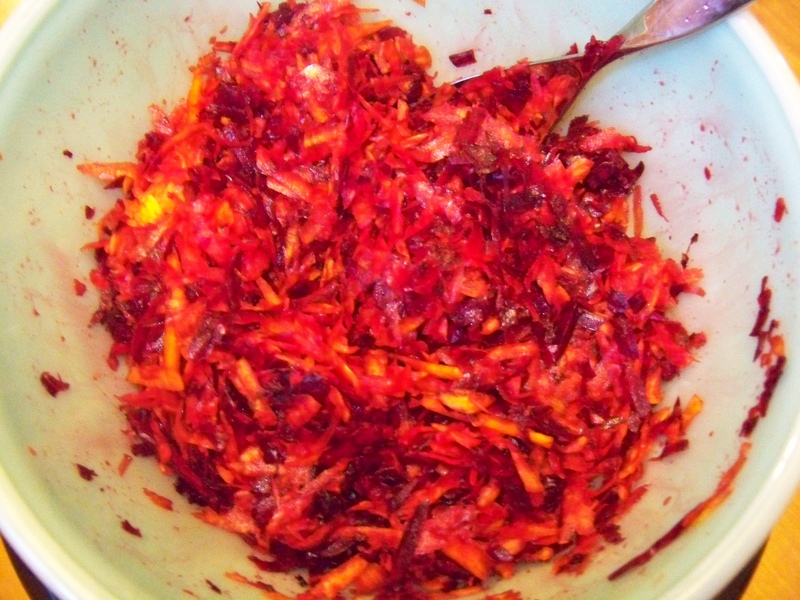 Basically, you need to peel and grate the beets (I used both red and golden beets for my version), being very careful not to give yourself a case of what I like to call “box grater rash.” Alternatively, you can julienne the beets with a sharp knife. You might be well advised not to be wearing your bestest white shirt while doing this. 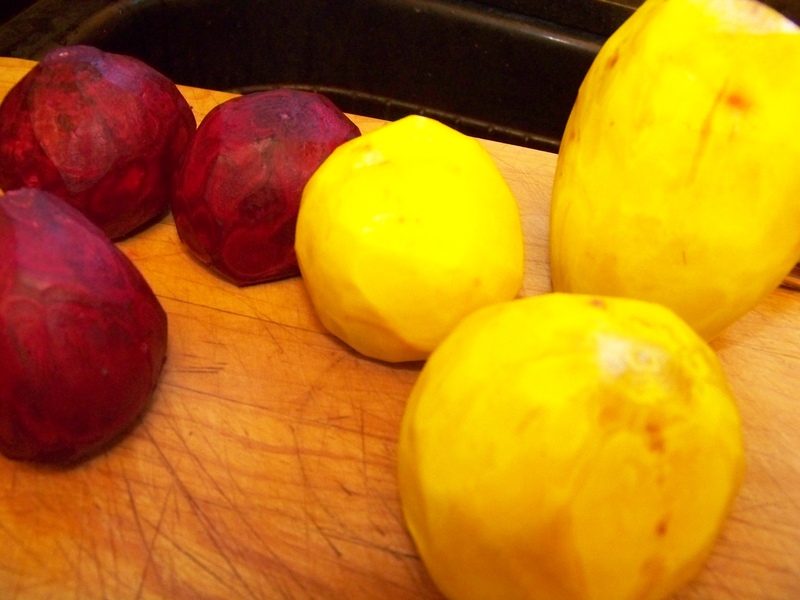 Fresh beets are juicy, n’est–ce pas? Yummy dressing for yummy salad. Serve, eat, and eat some more. The second-best part about this salad is that it still tastes terrific the day after. Mmmmm. Still good the next day. The recipe claims to serve four to six people, but don’t be surprised if your guests (or yourself!) are keen on seconds. As truth would have it, despite its being on pretty much every Thai restaurant menu in North America, the salad known as larb actually originated in Laos, though versions can be found throughout Thailand, particularly in the northern part of the country, as well as in Myanmar and China’s Yunnan province (where there is a significant Lao community). The recipes from which I concocted my version come from highly authentic sources, Bon Appetit magazine and Giada De Laurentiis. Fortunately, I’ve had it a about a gazillion restaurants, so I knew the flavour profile. Also, being in the greater Los Angeles area, I had access to ingredients that may be more difficult to obtain in Dubuque, Des Moines, or Denton. Prep consists of a bunch of chopping, followed by a little sizzle in the pan, followed by dumping said protein on either the trad lettuce (or radicchio or endive) leaf, or piling it on some mixed greens, as I did earlier this evening. It’s a mere 30 minutes from concept to plate, making it a perfect alternative to a rabbit food salad with a burger patty sitting forlornly alongside, and simple to prepare after a long day’s work, presuming you have all the ingredients to hand. For those who don’t have immediate access to fresh whole lemongrass (or who don’t want to work at cutting it into bits so small they don’t appear as wood chips in the salad), many supers in the US (including Kroger and its subsidiaries) carry lemongrass paste in the produce section. It’s a bit pricey, but one tube will take you a long way. 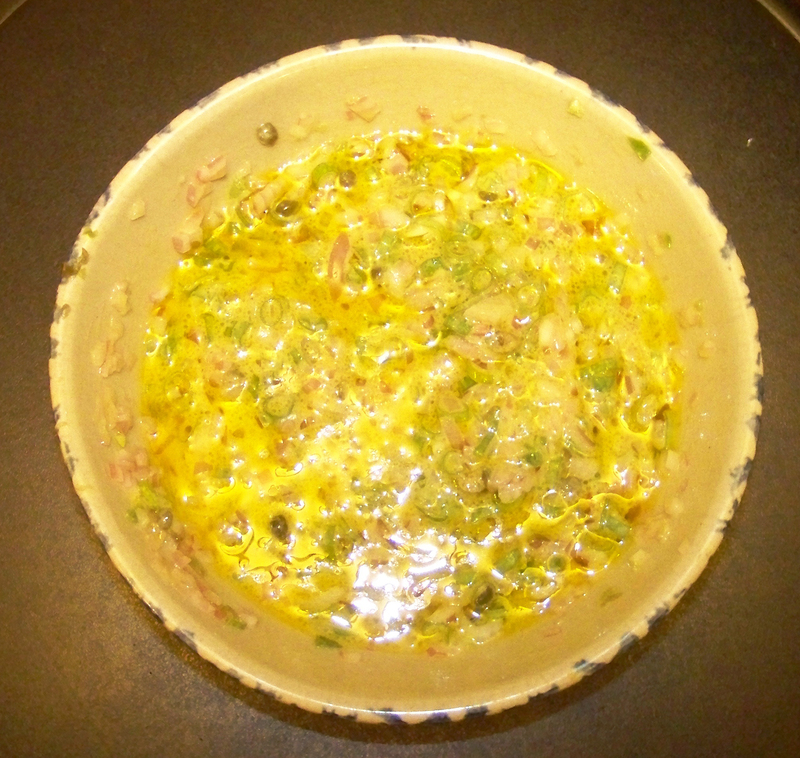 Stir all ingredients in a small bowl to blend; set aside. Combine ingredients 2-8 in a food processor, or just chop on cutting board. 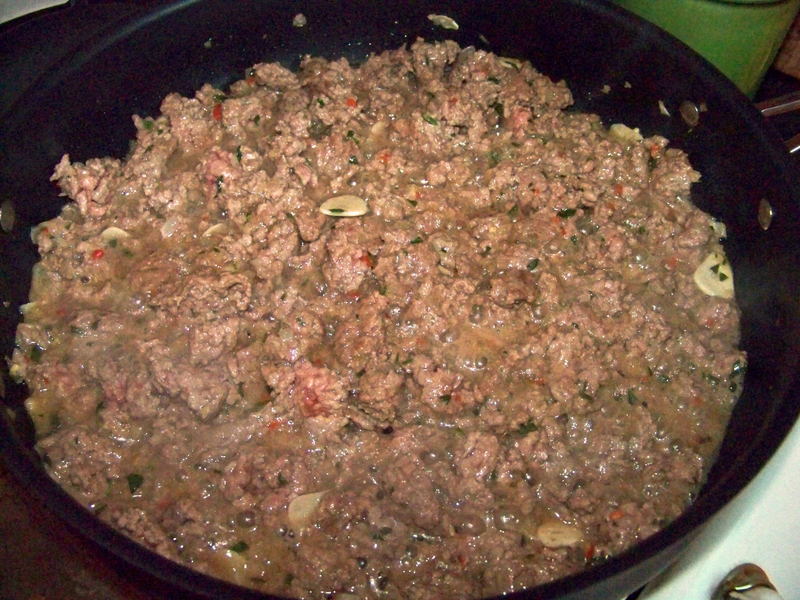 Season ground meat with salt and place it in a large heavy nonstick skillet over medium–high heat. Add spice mixture and sauté, breaking up meat into small pieces with the back of a spoon, until it begins to turn golden brown and is cooked through, about 6 minutes. Place mesclun (or a couple of iceberg lettuce leaves) on each plate. 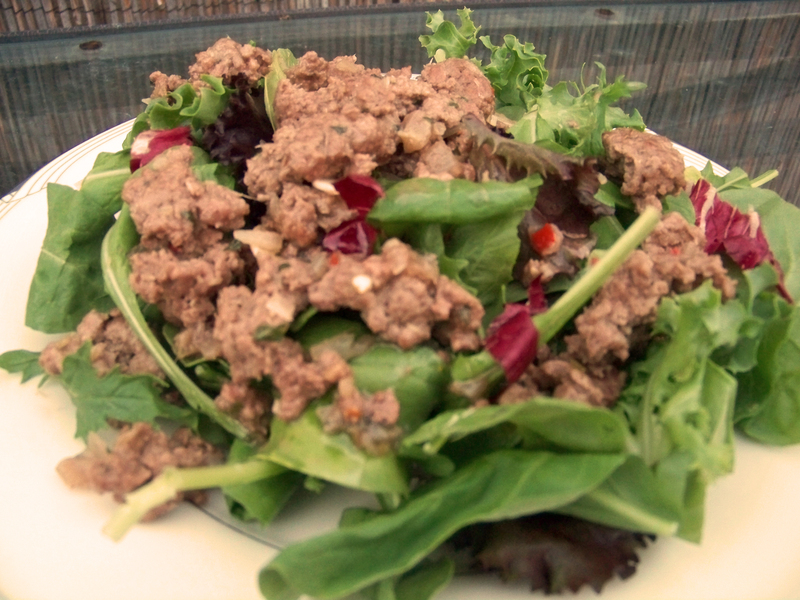 Top leaves with meat mixture, dividing evenly. Garnish with cilantro (if desired) and spoon reserved dressing over. It’s hot. It’s muggy. It’s summer. Who wants to stand over the stove for an hour or two to make a nice risotto? Not me, that’s for doggone sure. Instead, here’s a no-bake, so-simple-a-kid-could-assemble-it dish magnificently suited for a summer weeknight. I first tasted a version of this at Church & State bistro in downtown Los Angeles, and I was hooked. 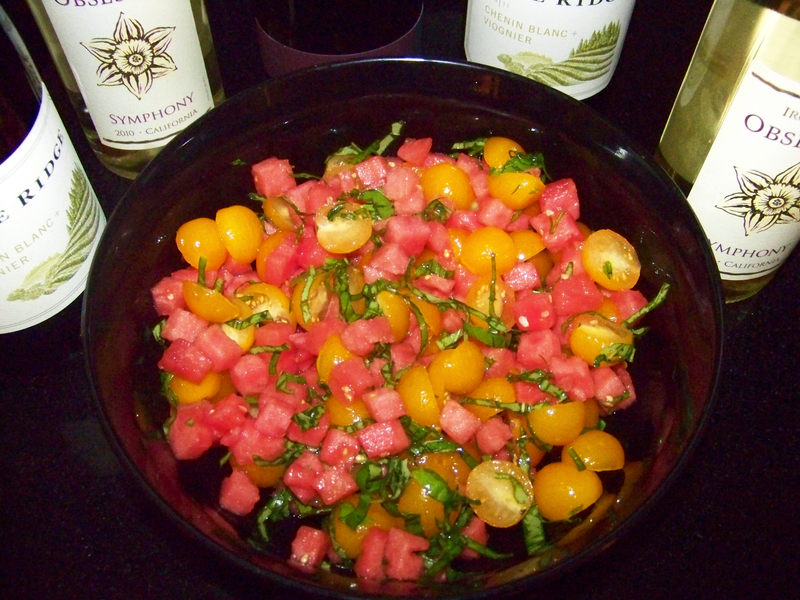 Slice and dice half a seedless watermelon (or an entire “personal size” watermelon, should you have one), chop up a fistful of fresh basil, take a 12 oz. container (or about 1.5 – 2 cups) of cherry or grape tomatoes and slice them in half, add about 3 – 4 tablespoons of balsamic vinegar and 1 -2 tablespoons of olive oil. Toss together in a bowl, allow the dish to chill for half an hour (or not), and have at it. Sprinkle just a tiny bit of kosher salt on each portion before serving. For an interesting variation on this recipe, substitute chopped mint for basil. As you can see from the photo, this salad pairs nicely with Pine Ridge’s Chenin Blanc/Viognier blend, as well as Ironstone Vineyards’ Obsession Symphony.